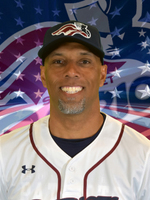 Barker enters his fourth season as the Third Base/Hitting Coach in Somerset. Under his tutelage last year, the Patriots as a team finished second in the Atlantic League in stolen bases (173) and walks (460), and third in on-base percentage (.348). The team also struck out the second-fewest amount of times in the league (850). Barker played in 235 games for the Houston Astros from 1999 through 2001. In 1999, Barker hit .288 with 23 runs scored, 21 hits, two doubles, a home run, 11 RBI and 17 stolen bases in 81 games played. He was originally drafted in the 11th round of the 1993 MLB draft by the Detroit Tigers. He spent six seasons in the organization before joining the Astros in 1999. His minor league career also included time in the Boston Red Sox and Baltimore Orioles organizations. For his minor league career, Barker had 430 runs scored, 656 hits, 113 doubles, 31 triples, 37 home runs, 262 RBI and 236 stolen bases.